For a ski mountain to be good, it has to offer the right stuff—the right snow, the right terrain and the right amenities. But for a mountain to be great, it has to go above and beyond, offering a comprehensive winter experience beyond “standard” skiing and riding. These Northeast mountains do just that. From bobsledding to snowshoeing, they’re proof positive that lift-served downhill skiing and riding can be just the tip of the iceberg. There’s a reason the readers of SKI magazine ranked Mount Washington Resort #1 in the East for snow, #1 in New Hampshire overall and top 5 in the East for scenery. Set in the heart of White Mountain National Forest against the backdrop of the lofty Presidential Range—including 6,288-foot-high Mount Washington, the tallest in the region— this is New England alpine grandeur at its best. 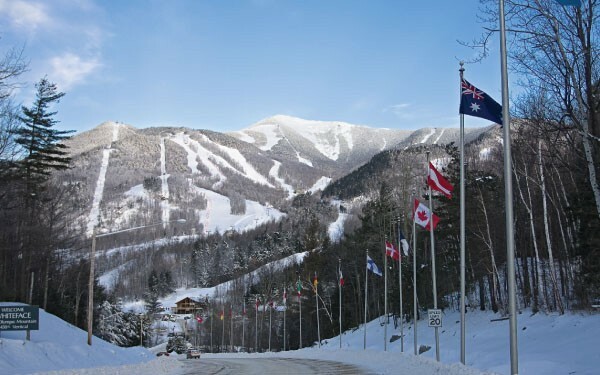 The downhill action takes place at the resort’s Bretton Woods alpine center, New Hampshire’s largest ski area with more than 460 skiable acres. Don’t miss the classically New England twists and turns of Bode’s Run on Bretton’s Mt. Rosebrook, designed by Olympic medalist and Granite State native Bode Miller. The slower pace and quietude of snowshoeing is another great way to see and explore the White Mountains. The on-site Bretton Woods Nordic Center links to 62 miles of groomed trails. Half- and full-day snowshoe rentals and guided two-hour expeditions are a great way for first-timers to explore the snowy wonderland. Or, just a four-mile drive south on Route 302—is Crawford Notch State Park, home to a dramatic pass through the mountains flanked by steep, high peaks. From the Appalachian Mountain Club’s Highland Lodge the myriad trail possibilities can be paralyzing. Two of the best options are the Crawford Path, the oldest continually maintained hiking trail in the nation, and Mt. Willard, whose summits offer iconic and stunning views of the Whites. For lodging, the must-stay locale is the Spanish Renaissance-style Omni Mountain Washington. The grand hotel opened in 1902 and in 1944 hosted leaders of the Allied nations for the famous Bretton Woods Conference that sorted out international monetary and financial details following the war. There’s no way around it: Saddleback is a hike and about as far north as a mountain gets before the currency changes. But that shouldn’t keep those looking for an authentic New England ski experience away. Saddleback’s natural snow is often rated as some of the best in the area and while the mountain is big (4,120 feet) it has the attitude of a little resort—especially as nearby Sugarloaf, with easily four times as many skiable acres, keeps growing into one of the largest resorts east of the Rockies. 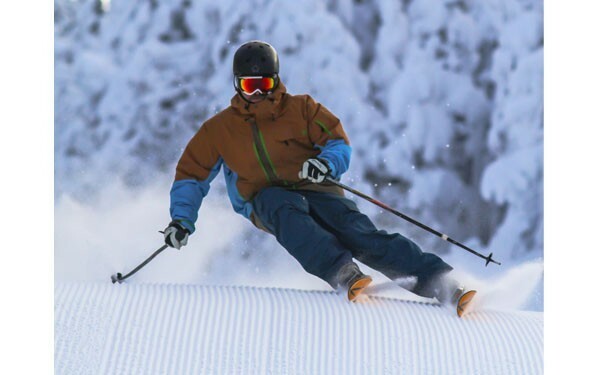 Their 220 skiable acres service everyone; beginner and expert terrain each account for 35 percent of the mountain’s trails with the remaining 30 percent for intermediates. New to skiing? Their Ski & Ride School has a low instructor to student ratio, with no class exceeding five students per instructor. And Saddleback uses every bit of its 4,000-plus foot peak to make for some very challenging trails. The Kennebago Steeps features 44 woody acres of the double black diamond Casablanca, where ski-carved trails weave in and out under a dense conifer canopy. It all funnels back to the Kennebago Station, a yurt with a sundeck and great northern views. At the base of the mountain is the Rangeley Lakes Trails Center with flat terrain dedicated to snowshoeing and a new intermediate trail a bit over a mile long. Expect to share the Geneva Loop with locals skijoring on skis behind their dogs. The center hosts two races in February, the state’s 5K and 10K snowshoeing championship on the 8th and the Rangeley Lakes Loppet (long distance cross-country skiing) on the 28th. When the six bodies of water that make up the Rangeley Lakes freeze over in late January it makes for scenic snowmobiling. A local club grooms 150 miles of trails that connect to the 260-milelong international circuit through Canada. Rent a sled from a local outfitter, grab a map and hit the trails or hire a guide to lead a group off the trails. 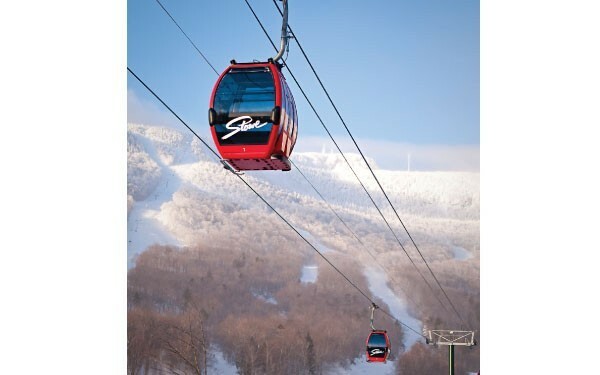 Stowe Mountain Resort features Vermont’s premier big-mountain skiing and riding experience on the slopes of Mt. Mansfield, the state’s highest peak. This is where the National Ski Patrol was born more than 75 years ago, and where the Army’s famed 10th Mountain Division recruited troopers for WWII. For those who can handle the trails’ expert rating, Stowe’s famous Front Four— Starr, Liftline, National and Goat—are a right of passage, the equivalent of walking onto the field at Yankee Stadium. Otherwise snag a ride on the Fourrunner Quad chairlift, which ascends Liftline, to watch others tempt their fate. But Stowe is more than lift-served downhilling—it’s also home to some of the best Nordic skiing in the Northeast. 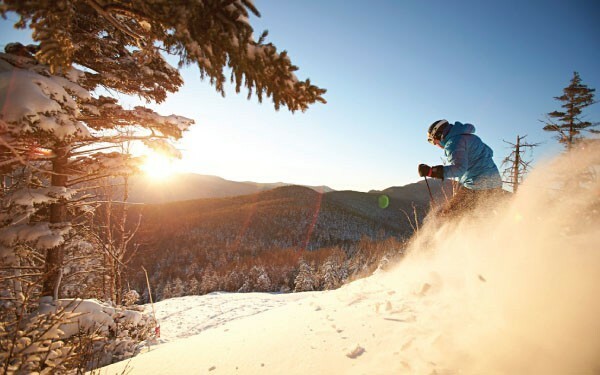 The mountain resort offers an extensive network of groomed cross-country trails that connect to those of the adjacent Trapp Family Lodge (yes, that von Trapp family). Stowe hosts the Stowe Derby, North America’s oldest downhill race on crosscountry skis; the 70th running takes place on Feb 22. Aptly named Mountain Road links one end of the picturesque, quintessentially New England village of Stowe—think white-steeple church and covered bridge—to the other end’s Smugglers’ Notch, a historical passage through the Green Mountains (closed to cars during winter). 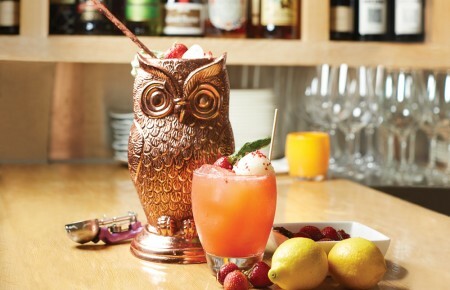 Many of the best lodging and dining options are along the road including Stowe Mountain Lodge, which blends modern amenities and base-area convenience with a “new Vermont alpine” style inspired by the rustic New England summer camps of yore. Tip: Late February typically kicks off Vermont’s maple sugaring season. Be on the lookout for open houses at many of the state’s sugarhouses and pick up some fresh syrup. Tonewood Maple, in nearby Waitsfield, even offers an adopta- tree program which includes a certificate, photo of your tree and a sampler with bottles of four different grades of pure maple syrup. Nearly 500 feet taller than Vermont’s Mt. Mansfield, Whiteface Mountain is the fifth-highest peak in New York, and one of the kings of the Adirondack’s High Peaks region. 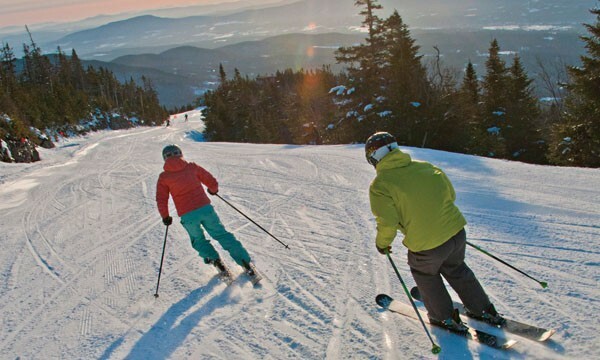 It’s got more than 3,400 feet of vertical and boasts the greatest vertical drop of any ski mountain in the eastern US. From the top of Little Whiteface, accessed via the Cloudsplitter gondola, it’s tempting to immediately hit the ski runs, but don’t miss the view from a modest observation deck facing southwest across Lake Placid, Mirror Lake and Lake Placid Village. Even more impressive is the sweeping vista across the densely forested Great Range—culminating in Mt. Marcy, New York’s highest peak. It can be had from the Riva Ridge trail, accessed from atop the Summit Quad. When conditions are good and ski patrol opens them, Whiteface’s Slides offer some of the only genuinely double black diamond in-bounds terrain in the East. Whiteface is also a mountain steeped in history, one nearly synonymous with the proud Olympic legacy of the quaint village of Lake Placid at its base. Whiteface hosted the men’s and women’s downhill ski runs in 1980, but to truly seize the full Olympic experience, sign up for the Lake Placid Bobsled Experience at the Olympic Sports Complex at Mt. Van Hoevenberg just up the road. Rocket through the course’s famous curves and straight-aways with an experienced pilot, or, for those craving even more adrenaline, try luge or skeleton (face first!) on a rented sled. For a tamer experience, ride shotgun on a Zamboni machine on the hallowed ice where the US men’s hockey team made Olympic history against the Russians in 1980. Whiteface Lodge, just off the edge of Lake Placid’s village, offers stunning views of its namesake peak and luxury accommodations evocative of the legendary Adirondack Great Camps. 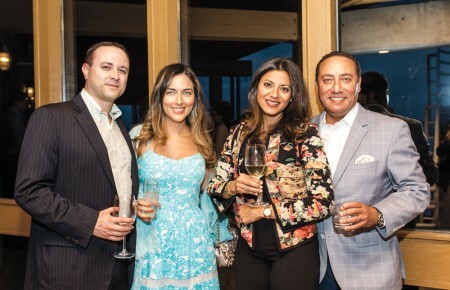 On-site restaurant Kanu (pronounced “canoe,” like the boat) offers some of the area’s best fine dining with locally sourced ingredients. Try Lake Placid Pub & Brewery’s New York State of Mind, a beer brewed exclusively with barley and hops grown in the Empire State. 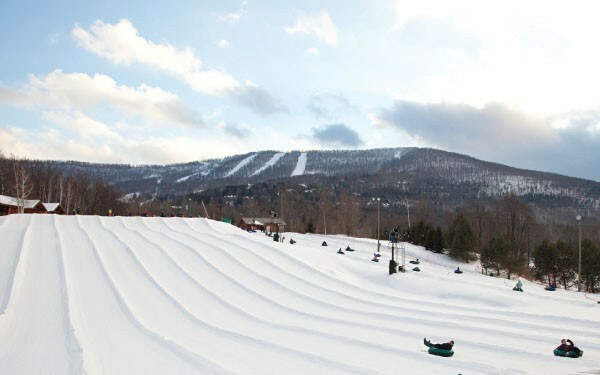 Situated on the northern tip of the Catskill Mountains, Windham is Long Island’s go-to mountain. After a scant two and half hour ride, skiers face a summit elevation of 3,100 feet with 1,600 vertical feet of downhilling spread over 50 trails— nearly all of which can be covered with snowmaking equipment if February isn’t cold enough. (Fingers crossed.) Windham’s East peak has runs of all levels, including the black diamond WinTuck added in 2011, while the West one leans more toward experienced skiers. But it’s after dark when things get really interesting. After 4pm, when the sun starts setting, nine trails come alive for night skiing into late February. There are trails for all levels, including Whisper Run (beginners), Lower Wheelchair (intermediate) and Wilbur (black diamond). Windham has non-skiing options aplenty, all of which are found at Adventure Park just across South Street. Want quintessential, Rockwellesq winter? Have at the 120×60-foot outdoor ice-skating rink. But if speed scratches the itch, there are two zip lines to sends kids (or adults up to 270 pounds) zooming 40 feet above the ground over 500 feet of snow. For group fun, pile six into a canvas-covered inflatable tube to swish down a 650-foot slope. Nowadays, every mountain hosts boarders, but Windham caters to them with massive pillows of air. The Big Air Bag allows riders to land big jumps by caressing them on their return to Earth. Originally intended as a training tool for freestyle skiers, the bag was designed in The Netherlands and provides a 56×33-foot landing pad and refills every 10 seconds to keep the line moving. Seasoned riders can enter Monster Energy drink’s throwdown competition, which visits the bag on Feb 14, for a nighttime competition followed by fireworks. Windham’s location makes it ideal for daytrips, but for those looking to spend the night, the Victorian Albergo Allegria is a quant, in-town bed and breakfast. Before hitting the slopes for the day, or I-87 for the ride home, fuel up on house-made granola or Belgian waffles.